I love recipe books and really cherish my collection (which keeps growing of course). They’re a comforting feature in my kitchen bookcase, ready for me to delve into whenever I need inspiration. I can’t tell you how many Saturday mornings I’ve spent sitting on the floor surrounded by cookbooks, planning my weekend’s dining. So I was thrilled to be sent a copy of Absolutely Foolproof Food for Family and Friends by Rosemary Shrager to review. It’s an amazing selection of over 300 classic recipes that also includes a clear explanation of the fundamental techniques you need to cook with confidence. Being both thorough and indecisive, I decided I had to choose three recipe to cook. The recipes are perfect for me in that they are ultimately easy to do but take a bit of time, effort and care. Here’s what I cooked. I marinated the cubes of lamb leg overnight in a spicy, lemony mix, threaded onto skewers with slices of red pepper and grilled. Served with a cucumber and mint raita. 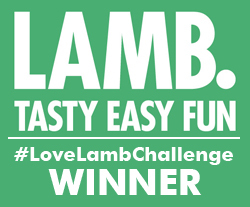 The lamb was flavoursome and tender and perfect dipped into the sauce. The chicken tagine involved marinating the chicken overnight and a simple cooking process. I chose this dish partly because it gave me the chance to use my lovely tagine dish that I got for my birthday. It’s so beautiful! Fresh, zesty flavours with underlying spices made for an amazing dish and the chicken thighs were so beautifully tender. And one of the best things about this dish was that it smelt so amazing throughout the cooking process. And then on to a fish dish. I chose halibut in a bag with fennel, tomatoes, black grapes and basil. I couldn’t find halibut in the shops so used plaice instead, which turned out perfectly. The fresh flavours and aromas that waft out as you unfold your foil bag are amazing. 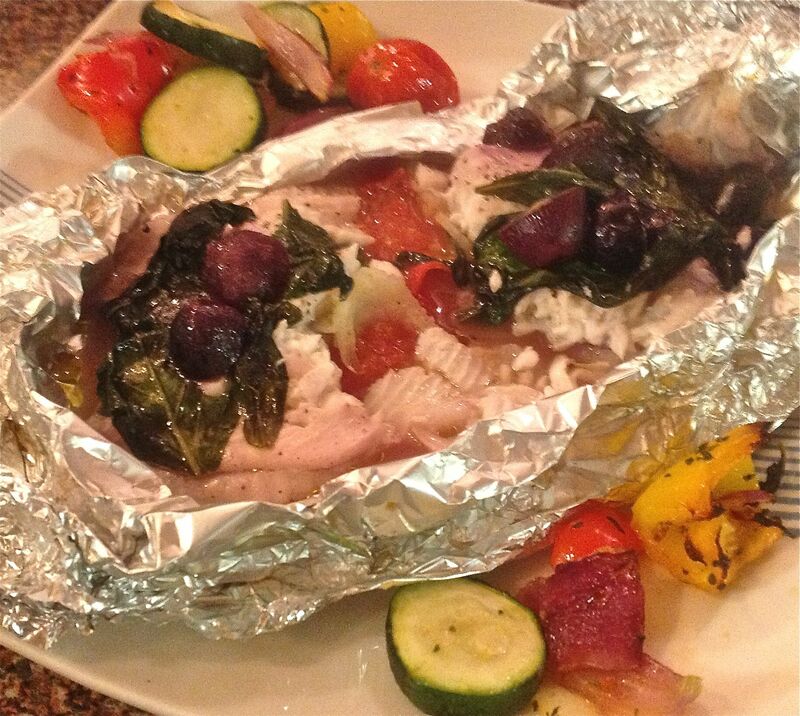 I served the fish with roasted vegetables and left it in the foil packages so we could spoon up all the juice. A lovely, healthy dinner. My verdict. This is a book I will continue to use as it has classic dishes as well as offering some different ideas and combinations. I’d never thought of black grapes cooked with fish and it worked really well. The tagine recipe is a classic and one worth repeating. A welcome addition to my shelf. They all look so lovely. Thank you, it is a lovely recipe book.